Pavel is the Smithsonian National Zoo's newest member. The Smithsonian National Zoo has debuted its first Amur tiger since 1948. 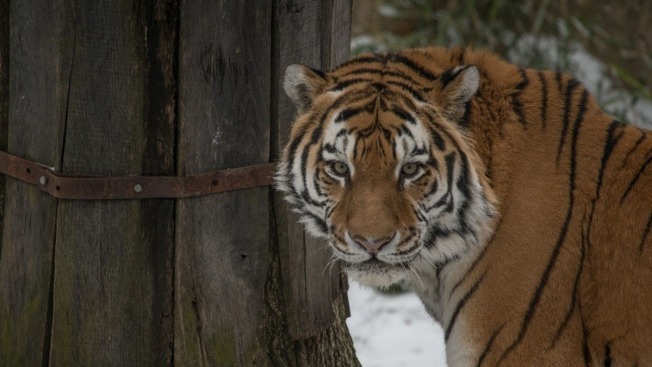 The Great Cats Exhibit welcomed the 10-year-old male tiger named Pavel on Thursday. Beginning Friday, Pavel will rotate daily on exhibit with the zoo’s Sumatran tiger, Damai, and African lions Luke, Naba, Shera, Shaka, Jumbe and Amahle. Pavel came from Chicago's Lincoln Park Zoo and keepers describe him as "reserved but laid-back when interacting with animal care staff." Also known as the Siberian tiger, the big cat is found throughout the forests of Russia and northern China. Due to poaching and habitat loss, the subspecies were driven to the brink of extinction. They are now considered endangered by the International Union for Conservation of Nature. Scientists estimate only 360 Amur tigers exist. According to National Geographic, Russia was the first country to ban tiger hunting and grant the Amur tiger full protection in 1947. The Smithsonian Conservation Biology Institute also plays an active role in saving the endangered species.